The children in Reception have been working really hard, both at school and at home. We are very proud of all their achievements and below are the children who received certificates last week. Following our enjoyment of Julia Donaldson's 'Superworm', Reception have been engaging in our very own Great British Worm Hunt. We have been investigating our immediate environments to observe worms in their natural habitats. We have discovered the dampest, darkest corners of our outdoor area, uncovering rocks, tiles and logs in our quest to find worms. We noticed that the worms like to fester underneath things where the soil is damp and therefore easier for them to make their little worm paths. We enjoyed discussing our observations, commenting on the appearance and movements of the wriggly, wiggly worms. Scarlett: " I am scared of worms. Actually, I love them." Vanessa: "I like to hold them." Ruta: "I am not scared of worms." Alex: "Look, there is a pink one!" Eleni: "And a black one!" Ali: "A big, fat, purple one! We can't wait to continue learning about the world around us when we come back from our Easter holidays. Hip, hip hooray for Superworm! Thank you for your patience whilst we have moved the Nursery. 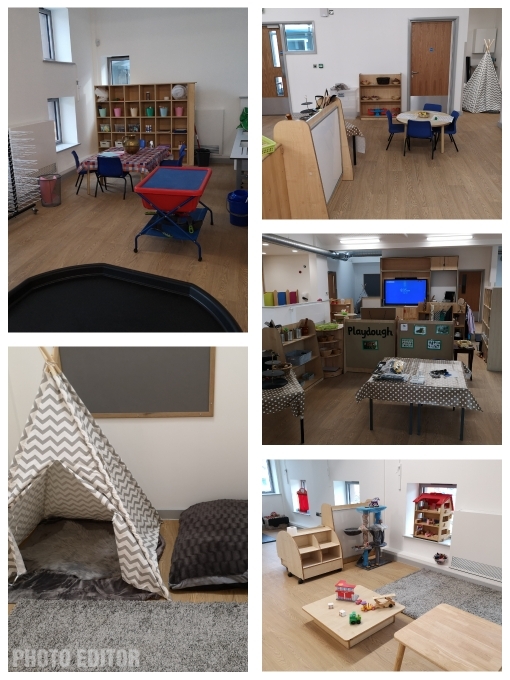 Staff are very excited for the children and parents to see the new environment, we are very sure the children will love the added space and make fantastic memories there in their last term of Nursery. This week our story is 'A little bit brave' a story about a little rabbit who finds some courage and has an adventure. It takes the children on a journey through lots of different settings introducing new vocabulary on the way. This week we will be re-establishing routines in a new environment and ensuring the children understand how to use and put away the equipment properly. However we also have lots of enhancements for the children to extend their learning with us throughout the week. On Monday it is Nursery and Reception's turn to pick litter. We will talk about our environment and why it is important for us to look after it. Each year our school council commits to raising money to sponsors young lady who lives in Uganda. This sponsorship is facilitated through the organisation Watoto. Watoto is a family of people from all over the world who are working together to ensure that the forgotten have a place to belong. On Wednesday 10th April, we are fundraising to raise money to cover the cost of Brandina’s sponsorship. We are asking children to come to school dressed in one of the colours of the Uganda flag - red, yellow or black. This could be a t-shirt or jumper, scarf or pair of socks. We suggest 50p per child towards the Watoto charity for the occasion. As it's almost Easter time the children will be encouraged to count the Easter bunnies carrots for him. They will be able to match or write the number of carrots for the bunny. We will be discussing our story of the week in small groups as part of our language activities this week. The children will be encouraged to answer questions including who, where, what and why about the story. As it is nearly Easter the children have lots of Easter themed stories and props to explore including 'Peter Rabbit A Pop up Easter Egg Hunt'. They have chicks and shells to count and sort independently. The children are also using our brand new cooking facilities to create their own Easter nests this week. They have picture cards to order and will be encouraged to work as independently as possible. If you would like to contact a member of the EYFS team via email the address is eyfs@broadford.havering.sch.uk. The peas are out of the freezer! As part of our work on the book Supertato by Sue Hendra, we froze some 'escapeas' in ice cubes. We then talked in partners about how we could get them out and came up with lots of ideas. Ethan- "Lets put it in the sun." Faramade- Lets shine a torch on it!" Ryan- "Hold it really tight in your hands." And then we tried some of them out. Billie- "It's so cold, I don't want to touch it!" Larissa- "It's all dripping down my arm!" By the end of the lesson we had 'escapeas' all over the class room! Nursery - Closure for moving day. A reminder for Nursery parents that Nursery will be closed for children on Friday 5th. This is to enable staff to safely re-position furniture, unpack resources and create a lovely environment for children to return to on Monday. We look forward to showing the new Nursery to parents and children next week! We hope you all had a lovely Mother's day weekend and were able to spend some quality time with your children. This week is finally moving week! Please excuse any interruption to normal routines this week, furniture and resources will need to be gradually moved. We have lots of fun activities planned around this to minimise any disruption to children and plan to carry on as normal as much as possible. 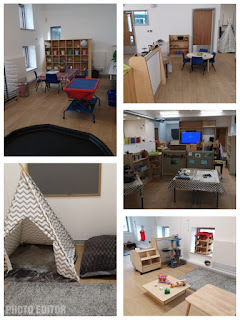 We can't wait to let the children explore their lovely new classroom the following week. The Nursery will be closed on Friday 5th April to enable staff to safely move and position furniture and create a great environment for the children to come into on Monday. We apologise for any inconvenience this may cause. This week we are consolidating numbers previously taught and playing Maths bingo. The children will be encouraged to count small quantities together and match this to the numbers they have learnt. Please continue to support your children to count objects and spot shapes and numbers around you. We will be using the outside environment this week and listening carefully to the sounds we can hear. The children will be encouraged to find natural objects that can make a sound together, e.g. 2 sticks to clank together or a handful of leaves to rub together. We will listen to each others sounds in small groups and try and play along to some group tunes. We are sharing stories about mini beasts this week including The Very Busy Spider. After talking about the minibeasts and looking at evidence to check where we might find them the children will go on their own minibeast hunts in small groups. They will be encouraged to look closely at creatures and talk about similarities and differences. Last week was a busy one, full of rescuing carrots, capturing peas and a lot of letter writing as well. We are continuing with ‘Supertato’ for a few more days as we make our own vegetable superheroes. This week we will also begin reading ‘Superworm’ by Julia Donaldson. The children will be searching for minibeasts and worms as well writing potions to defeat the evil lizard wizard. We are encouraging children to use talk to organise, sequence and clarify thinking, ideas, feelings and events. As we continue to develop the children’s fine motor strength we are now also focussing on their letter and number formation as well. Particularly encouraging and correcting backwards formed letters and numbers. We are looking at time this week. We will be timing how long it takes us to tidy up, line up, get ready for home. Perhaps you could time things at home, how long it takes to brush your teeth, how long it takes to get dressed. We will be encouraging the children to use everyday language related to time as well as time short periods of time. We will be writing potions to help save Superworm and defeat the evil wizard lizard. The children will be designing and making their own vegetable superheroes from a range of vegetables and resources.